Literature reviews are undertaken by students, researchers, clinicians and educationalists – that is, almost all nurses. Despite much excellent work, exploring the assumptions and practices that constitute searching for and reviewing literature has merit, and prompting those who undertake these activities to think critically about what it is that they are doing should be encouraged. Widely adopted approaches to structuring reviews (the ‘standard model’) can detrimentally limit the scope or range of literature that is accessed and appraised. It is further proposed that a lack of professional ambition or confidence invests aspects of the way some nurses engage with the sources that are available to them. Across the book, parochialism is challenged. The crucial role that values and judgement play in reviews are highlighted. It is argued that humanity and arts texts deserve, potentially, a bigger or more assured place in reviews undertaken by nurses. Difficulties in appraising quantitative and qualitative research reports are identified, and benefits linked with taking a contemplative line through the review process are considered. This book contributes to debates around evidence-based practice and literature reviews more generally. It will appeal to anyone with an interest in professional issues, research, and the philosophy and sociology of nursing. Martin Lipscomb is a Senior Lecturer in the Institute of Health and Society, University of Worcester, UK. He is also Secretary to the International Philosophy of Nursing Society. "Nursing Literature Reviews explores important ideas on the nature of scholarship and evidence in healthcare. Martin addresses key issues facing the nursing academy. This is a valuable resource for any graduate nursing programme." — Professor Bernie Garrett, The University of British Columbia, Canada. "An important book on an important topic, and a thoroughly enjoyable read." — Visiting Fellow John Paley, Sheffield Hallam University, UK. "Timely and much-needed and, as usual, beautifully written and deeply engaging (well, it engaged me anyway)." — Emeritus Professor of Nursing Gary Rolfe, Swansea University, UK. 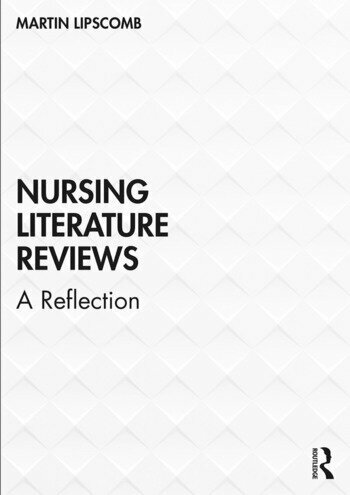 "The literature review has become ubiquitous in nursing yet, as Lipscomb details in this comprehensive investigation into the genre, it is neither simple nor susceptible to formulaic execution. On the contrary, the literature review is often underappreciated as a highly complex and intellectually demanding activity that should not to be taken lightly. This book is a must read for anyone with serious intentions regarding undertaking or supervising a literature review." — Associate Professor Derek Sellman, University of Alberta, Edmonton, Canada, Editor-in-Chief Nursing Philosophy and Director of the Unit for Philosophical Nursing Research. "In this intriguing book, Lipscomb takes up the practice of literature review within nursing. He walks us through some of the current debates and positions in a manner that allows for a critically reflective consideration of what it means to engage with literature in the modern context. I consider this book required reading for graduate students. Not only will it inform their thinking with respect to research and scholarly projects; it will also entice them into a more philosophical conversation that allows for reflection on how knowledge works within an applied practice discipline such as ours." — Professor Sally Thorne, Editor-in-Chief Nursing Inquiry, The University of British Columbia, Canada. "This clever book works the miracle of making literature reviewing a fascinating and subversive activity. It is shot through with barely concealed mischievousness. Lipscomb uses the apparently prosaic opportunity provided by literature searching to deal with a host of intriguing and important debates in the profession. Setting out to merely challenge his academic colleagues, Lipscomb’s number one enemy is parochialism." — Professor Michael Traynor, Middlesex University, UK.